In October of last year, a recently formed group at Washington University in St. Louis called the Conservative Leadership Alliance (CLA) participated in a nationwide right-wing scarefest know as "Islamofacism Awareness Week" designed to convince everyone that the biggest threat facing America is a bunch of terrorists hiding in our linen closets and under our beds. Across the country, this failed experiment in scaremongering featured such right-wing "intellectuals" as Ann Coultier and Michele Malkin on college campuses ranting about how Muslims want to eat our babies. At WashU, the invited Islamophobe was Daniel Pipes, a failed scholar known for engaging in academic witch hunts against people with different political views and for claiming that 85% of Muslim organizations are infiltrated by "Islamists" who want to destroy Western civilization. A peace group I am a part of on campus was approached by other people and asked if we could help coordinate a response to Pipes' visit. This was a touchy subject, since we of course thought that Pipes' views are dangerous yet most of us share the general academic viewpoint that its a good thing to let people express their opinions no matter how repulsive those opinions may be. What we ultimately decided was that we would hold a protest, but one that exposed the danger of Pipes' view rather than suggesting that Pipes shouldn't be allowed to speak. We had a "teach-in" with about 40 people outside Pipes' event, holding signs that said "no hate" and passing out literature that provided background on Pipes and the right-wing groups sponsoring the event. The most interesting thing about Pipes, for present purposes, is that despite his craziness he at least seemed vaguely conscious of the fact that saying that all Muslims are violent extremists would make him pretty obviously a bigot. Pipes got around that issue by saying that not all Muslims were bad, but all "Islamists" were bad, and were so by definition. And "Islamist" was a vague term that Pipes used to describe both violent terrorists and any Muslims who had different political beliefs than he does (for example, any Muslim who thinks that Palestine should have its own state would automatically be an "Islamist" on Pipes' definition). This way, Pipes could claim both that Islamists (as in the terrorists) want to destroy Western civilization and that Islamists (as in people who disagree with him) are scattered throughout U.S. society and academia in particular. Thus, of course, they are Big Big Scary Threat to Society. The formal term for this kind of argument is equivocation. And the CLA took full advantage of this equivocation, constantly trying to scare everyone about Islam while reminding everyone that they weren't saying that all Muslims are violent. Spencer argues that when followed, Islam promotes discrimination that poses a threat to the equality and freedoms Americans enjoy. Spencer argues that the Quran and holy texts can only be followed in an evangelical manner. According to Spencer's lecture, Islam poses a threat because of the violence promoted in the Quran itself. I don't think there's any way to read these claims as saying anything other than if someone is a practicing Muslim, then they are necessarily a threat to Americans. Thus, Spencer proudly embraces the bigotry that Pipes tried so hard to hide. And what did the CLA have to say about this, considering how important it was for them previously to point out that they weren't Islamophobic when Pipes was visiting? The CLA organizer, "said he felt that the group supported Spencer's message." In my opinion, these kinds of speakers are dangerous to society. They intend to make people distrustful of all Muslims. They classify certain political beliefs as being equivalent to supporting terrorism. I don't think it's any secret that Americans' blind willingness to lump all predominantly Muslim countries together contributed to the ease with which Bush was able to push us towards war on Iraq. What's more, Pipes and Spencer share the belief that the most dangerous Muslims are not the ones holding machine guns (since they are too obvious), but rather "secret Jihadists" who have infiltrated society and are lurking among us. Thus, they want us to be distrustful of even the most honorable and upstanding people in our communities, if those people happen to be Muslim. Should this kind of speech be allowed on campus? In general, I tend to err on the side of free speech, and just assume that most people (especially on a college campus) will recognize how ridiculous the claims are. On the other hand, there is a point at which you cross the line into calling for violence. Claiming that all Muslims are inherently violent and intent on destroying Western civilization has to be pretty close to that line, if not already over. "TA [name omitted by me]" is a perfect example of a lying Muslim who will do anything to cover of the true teachings of his religion. Again, The Crusades were not acts of unprovoked aggression by Europe against the Islamic world, BUT A DELAYED RESPONSE TO CENTURIES OF MUSLIM AGGRESSION...Go, Crusaders. Fight back against the Muslim Aggressor. Defend yourselves - as you have EVERY RIGHT TO DO. Stop the Islamization of the West - the death knell of the Free West. Islam deserves to be feared and hated, as it's primary goal is to subjugate and murder all non-Moslems until the world is "all for allah" - i.e. worships allah (a non-existent pagan moon deity) alone. Islam deserves to be feared and hated just as we fear and hate Fascism and Nazism. This "informative article" was obviously written by a moslem operative engaging in taqquiya, "warning" everyone about the so-called opinions of the learned Daniel Pipes and Robert Spencer. This a splendid example of crackpot journalism. So many gullible American kuffar to lie to and so little time. WOW! SO much in one editorial! Intellectual dishonesty! Inaccuracies! Mistatement of facts! Disregard for truth! PLUS an obvious agenda that shines through all the intellectual dishonesty. Once-prestigious Washington University, named after the Father of our Country, has turned into Slaves-to-Barbarian-Islam U, due to the lies of political correctness and multiculturalism, esp. concerning the Islamic Barbarians. And after 9/11 - For shame, you Slaves. Bravo Robert Spencer and Geert Wilders - the Churchills' of our time. Meanwhile, you Leftist MoonBats at WU are the Appeasing-to-the-Nazis-Chamberlains. Shame on you. Thank you for writing this article and helping me to decide to not send my children to your school. I guess this is the type of "journalism" that Washington University produces! How sad. How scary for the future of journalism! These comments, to me, provide the best evidence that people like Spencer are doing far more to stoke the fires of hatred then to promote healthy discourse. Today is the first day of cuts to Metro services in St. Louis. So far, the cuts have been a disaster, just like many people predicted. The Post-Dispatch writes that we have one last chance to avert mass transit collapse. Please check out Midwest Common Sense's diary to see how you can help. STL Rising lists (tongue in cheek) the top ten benefits of the restricted Metro schedule. The St. Louis mayoral candidates debated last night. I couldn't find much coverage online, but the Beacon had a pretty thorough article. It's no secret that print media is struggling, and the Beacon is an experiment in all-online news. My opinion is that in order to be successful, papers need to do more than just get rid of publishing costs, they need to actually return to providing solid coverage of local politics, and this Beacon article is a good step in the right direction considering how limited other media outlets' coverage of the event was (although, I admit, there might be other coverage that I couldn't find..please let me know if you saw some). Honestly, how could anyone think that providing coverage of the first mayoral debate isn't important? In other mayoral news, the Green Party candidate for mayor's van was torched last night. Suburban Journal article on "Saving a sense of city" (h/t Michael Allen). Antonio French's Twitter feed says all charges against him by his former aldermanic opponent were dismissed in court. Possible "Pay to Play" in GOP Committee Assignments. Statehouse Republican says providing children with health care is "like slavery." If you haven't already, check out SLU's absurdly good "Atlas Week" events (which thankfully, is not referring to Ayn Rand). If you have anything to add, please post in the comments. At a Metro public forum Friday, State Senator Joan Bray called for a HUGE mobilization in the next WEEK or two to push for urgent state funding to reverse the drastic Metro cuts taking effect Monday, which will leave 12,000 people with no access to transportation whatsoever, and the rest of us with a 43% reduction in service. Metro gets less than 1% of its funding from the state of Missouri - just $1.3 million out of a $221 million budget - while other states (Illinois included) get 1/2 their public transit funding from the state. "What can these funds be used for?" - "Development and Implementation of Transportation Programs to conserve energy...."
There are a lot of amazing events coming up this week, include a bunch that are a part of Saint Louis University's "Atlas Week." I list a few of the Atlas week events below, but you should really check out the whole schedule here. Monday March 30, One of the aforementioned Atlas Week events is "Voices and Music of Israel". The event will be from 11 AM to noon at the Busch Student Center at SLU, and you can RSVP here. Also Monday, and also at SLU, the newly-formed InterFaith Alliance is hosting an InterFaith Prayer Service from 4 to 5 PM in the Knights Room of the St. Louis Library. Also Monday, you should probably just hang out at SLU all day, because there's going to be a great talk at the Bare Fuller Lecture Hall on "Social Justice and the Limits of Democracy" by Dr. Peter McLaren. The talk will focus on the expectations and the realities of social justice in the age of neoliberal capitalism. To find out more, go to this link. Also Monday, if you haven't made up your mind about the St. Louis mayoral election, or even if you have, you might be interested in the debate between all four candidates being sponsored by the League of Women Voters. The debate is from 7 to 8:30 PM at the Central Branch of the St. Louis Public Library (1301 Olive Avenue), and you can find a little more info here. Also Monday, SLU Atlas week screens the movie "War Child" about Emmanual Jal, a former child soldier in Sudan's civil war who is now an international hip hop start with a message of peace. The movies in in the Busch Student Center, in the St. Louis Room, and goes from 8 to 10 PM. You can RSVP at this link. Jal is also going to be speaking on campus on Wednesday (see below). Tuesday, March 31, from 8 AM to 5 PM there will be a clinical conference on war zone trauma titled "When the War Comes Home" at the Kohler Auditorium on the 2nd floor of St. Mary's Health Center, 6420 Clayton Rd. The workshop is free but can provide continuing education credits for $10. It looks really interesting, so get the full information at the IOW calendar. Also Tuesday, from noon to 8 PM, the St. Louis Contemporary Art Museum is sponsoring a visit by the traveling art exhibit "It is what it is: Conversations about Iraq." The exhibit is a collaboration of an artist, a Iraq war veteran, and an Iraqi refugee that has been touring the country. It will be at Leland and Melville Ave in the Loop from noon to 5 PM, and then at the Contemporary Art Museum at 3750 Washington from 6 to 8 PM. You can find out more and RSVP at the facebook page. Also Tuesday, STAND at SLU is hosting a discussion of the crisis in Darfur at the Busch Student Center room 256. The presentation includes historical contexts, current situation, and political ramifications and concludes with suggestions on how concerned citizens can help alleviate the dire situation. The talk is from 5:30 to 7 PM and you can RSVP here . Also Tuesday, Danielle Mackey has been working with the SHARE Foundation in Nueva San Salvador-El Salvador, as their Grassroots Delegations Coordinator after graduating from SLU last year. She's meeting with people to share her experiences and get feedback at 1077 S. Newstead Ave. at 7 PM. Wednesday, April 1, Emmanuel Jal, the former child soldier mentioned and star of the documentary mentioned above, will be speaking at SLU in the Wool Grand Ballroom of the Busch Student Center, from 5:30 to 7 PM. Get the full details at this google calendar page. Also, Wednesday, S.A.G.E. at Fontbonne University is screening the MTV movie "Pedro", about Pedro Zamora, the first openly gay, HIV-positive person on American television. The movie will be from 7 to 9:30 PM in the DSAC Cafe, and you can find out more here. Thursday, April 2, WashU's Green Action is screening the documentary "Black Diamonds" at 5 PM in Siegle Hall Rm L006. The documentary discussed the harmful effects of mountaintop removal coal mining on the communities of Appalachia. The screening will be followed by a discussion led by a local coal activist and two Washington University students who recently traveled to Tennessee for Mountain Justice Spring Break. Also Thursday, WashU's Amnesty International chapter is hosting their annual "Jam for Justice" at the WashU Co-op at 6021 Pershing. This event has gained quite a reputation on campus for being consistently awesome, so you really should check it out. The event runs from 8 to 11 PM, and you can find the lineup at AI's event page. All proceeds go to the St. Louis Center for Survivors of Torture and War Trauma. Friday, April 3, James Yee, a former US Army Chaplain who ministered prisoners at Guantanamo Bay, and later arrested after speaking out against the cruel and degrading abuse prisoners endured (all charges were later dropped), will be speaking at the ACLU of Eastern Missouri (454 Whittier St.) at 6:30 PM. It should be an amazing talk. If you would like to attend, the organizers have asked for people to RSVP by calling 314-652-3114 ext. 26 or emailing john@aclu-em.org. Also Friday, the Landmark's Association of St. Louis is hosting Jesse Irwin, the Red-Headed Strangers, and the Monads in a fundraiser to benefit the Alliance to Save Cleveland High. The event goes from 9 PM to 1 AM at the Wedge (442 Bates Street). Find out more here. Saturday, April 4, the Missouri History Museum is hosting Congresswoman Maxine Waters and Congressman William Lacy Clay, Jr. for a discussion of the question "Has the Dream been Realized?" The event goes from 3 to 5 PM and you can find out more at this link. Also Saturday is the first performance of Staging Old Master's at the Pulizter Foundation of the Arts. The play was written and performed by former prisoners in conjunction with the Prison Performing Arts program. The play starts at :6:30 at the Pulitzer (3716 Washington), and you can RSVP and find the full schedule of performances here. Sunday, April 5, from 9 AM to noon, is the Roffman Family Day of Service, an event put on by Gesher City St. Louis, St. Louis Hillel at WashU. and the YPD of the Jewish Federation. There are a lot of possible service opportunities, so go to this page to find out more. Also Sunday, Sarah Miller will be hosting "Yoga for a Cure" from 2 PM to 3:15 PM at the Unity Point School (Boskydell Road Entrance) in Carbondale, IL. Proceeds go to the American Cancer Society, and you can find out more here. Also Sunday, Faith Leaders for a Compassionate Missouri Budget will be holding a rally from 2 to 4 PM outside the Old St. Louis Courthouse at 11 N. 4th Street. This rally is in response to the hundreds of millions of dollars being cut from critical services to help children, the elderly and the disabled by the Missouri House of Representatives. RSVP right away to get involved in this critically important issue. Also Sunday, the Royale is hosting a discussion on Transportation, moderated by Bob Duffy of the St. Louis Beacon. The Royal is located at 3132 S. Kingshighway and the discussion starts at 5 PM. RSVP here. Finally, I wanted to give a bit of advanced notice for an important event taking place on Monday, April 6. Several organizations at. 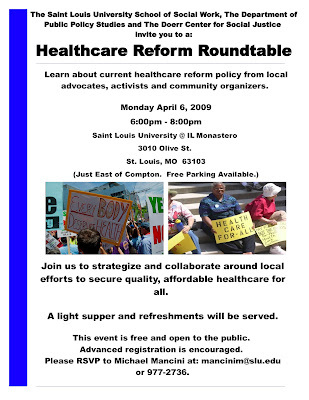 Louis University are hosting a Roundtable Discussion on Healthcare Reform. The event will be from 6 to 8 PM at the IL Monastero and features speakers from several important local progressive groups. You can check out the flier here . Hello and welcome to the new St. Louis Activist Hub blog! This will be the home of the weekly event listings sent out via the St. Louis Activist Hub facebook group. It will also hopefully be a place where left-0f-center residents of the greater St. Louis metropolitan area can get together to discuss local issues, offer their opinions on state and national issues, and compare various strategies of working for progressive social change. I'd love to have a wide range of participants, so if you think you'd like to contribute to this blog please send me an email at washupeacecoalition@gmail.com . 1. Hopefully, a wide range of people will contribute to this blog. Hence, there will be no grand unifying "position" of the blog. Each person (including me) speaks only for themselves, so any claim that "The Activist Hub" has taken some position will be false by definition. Of course, you are welcome to say that I personally have taken a position if such a position is reflected in one of my comments or posts. 2, Personal attacks on other blog participants and abusive behavior will not be tolerated. This will be a forum for addressing ideas, and therefore effective arguments will be those that discuss issues and facts rather than personalities. 3. Sometimes it is necessary to mention character traits when discussing public officials, since these traits can be relevant to whether they should be elected. However, if one is engaging in harsh attacks on public officials, these attacks should in general be backed up by primary sources (links to news articles, TV reports, or other trustworthy sources of information). 4. As is stated above, this blog is a place for discussing effective strategies for progressive change. Thus, I am not particularly interested in having to deal with right-wing propaganda or talking points. I do think it is important for people of different political persuasions to discuss important issues, and fortunately there are plenty of other places on the internet where this can happen. 5. In general, I tend to err on the side of free speech, and will consult with other people in cases where intervention is required. However, I do reserve my right as the creator of the site to make final decisions. Anyway, I have no idea whether any of this stuff will actually be relevant to this blog or not, but I wanted to get it out there to cut off any potential problems. Since hopefully this blog will consist primarily of the cool people who are members of the facebook site, I'm optimistic that this will be a site full of thoughtful and productive conversations.